Buccaneer Double Braid Dock Line is made from 100% nylon, combining high strength with good flexibility and shock absorption. Tip: bow and stern lines should be 1-1/2 to 2 times beam width, spring lines should be 3/4 times boat length. 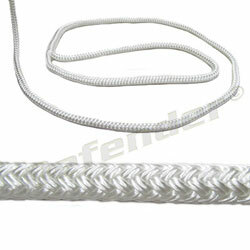 NOTE: Line sizes of 5/8" and under have a 12" pre-spliced eye, and line sizes of 3/4" and up have an 18" pre-spliced eye.